This cake was made from a pyrex bowl instead of a pan. After frosting the mound, I put ropes of fondant on the cake and then covered it with fondant, to give it the shape I wanted. The brim was just rolled out fondant. 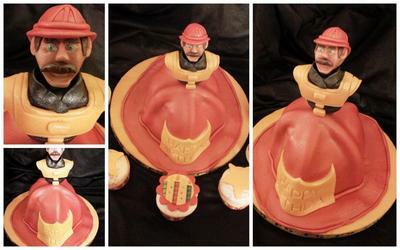 The figure bust was made with fondant and tylose and attached with a skewer. the "badge" on front was imprinted with a happy birthday stamp. very, very pretty. I love it, good job. Hi Trinity! Please just add the rest of the description as a comment. I will then add it to the cake description and delete the comment. Thanks! Part of my description was cut off. I realize this is very brief because of it. If there is any way to add it in, let me know and I will fix it.